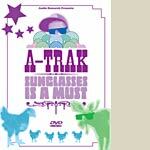 A-Trak finally releases his first full length DVD! Sunglasses Is A Must takes you from A-Trak's first purchase of turntables with barmitzvah money, up to all the battles he entered, all the continents he discovered, all the zoos he visited and all the wonderful people he met along the way. DVD highlights include World DMC, ITF and Vestax Championship highlights, practicing and recording with DJ Q-Bert, Mixmaster Mike playing host on tour with the Beastie Boys, behind-the-scenes pranks with The Allies, A-Trak in the lab with Roc Raida (X-Ecutioners) and KLC (Beats By The Pound), making DIY music with Money Mark and Peanut Butter Wolf, shoe shopping and private jet flying with Kanye West, and Globetrotting across China, Italy, South Africa, Japan and Australia.